The 11th item in my adventure to a Tesla Roadster is a Comfort Cruiser E-Bike w/ balloon package from Pedego in the color of your choice (2175$USD Value)! So if you always wanted an e-bike – here’s your chance to get one cash free. Let’s strike a trade deal! You can contact me <HERE>. 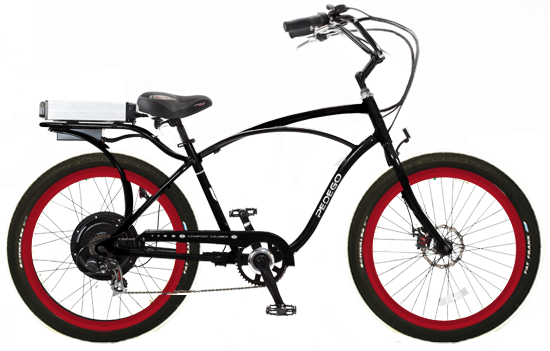 – 1 Pedego Classic Comfort Cruiser E-Bike. – Balloon Package Upgrade witch includes Schwalbe Fat Frank Balloon Suspension Tires, extra comfort suspension seat, padded stitched handgrips. Your choice of creme, brown, black, or grey balloon package. – Pick the color of your Pedego! Colors are limited however, so backup color should be picked. Colors can be found in the online store (LINK HERE). – Item can only be shipped to a continental US address. Your choice of upgraded creme balloon package, upgraded brown balloon package, upgraded black balloon package, or upgraded grey balloon package.